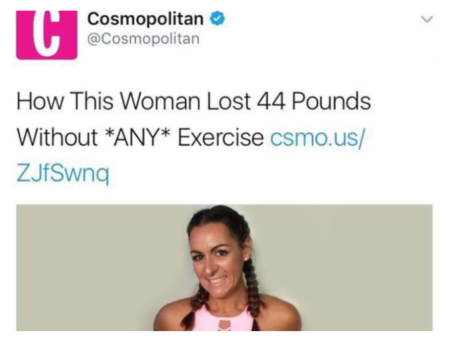 Cosmopolitan US is under fire after its social media outlet misled readers through a weight loss clickbait. The tweet titled “How This Woman Lost 44 Pounds Without ANY Exercise” sucked audiences into reading about one woman’s weight loss journey, as if the article were to answer all the readers prayers. 31 year old Melbourne woman Simone Harbinson featured in the article, detailing the journey of her weight loss experience through an avenue that did not involve exercise. What readers aren’t privy to until getting into the depths of the article, is that Ms Harbinson’s journey details serious health issues, a diagnosis of cancer and the ups and downs of her health battles (both physical and mental) before carrying out the nutrition advice of an online “nutrition” personality. The original article posted online has since been edited to send the message of overcoming obstacles – which really should have been the crux of the article in the first place. What concerns me, however, is the possibility of many other misleading weight loss articles enticing vulnerable readers in to their publications through the use of catchy titles and social media coverage. The lengths media outlets will go to for ratings/readers. The point here is, having a healthy relationship with our health is vital, both physically and mentally. Whilst it’s hard not to get sucked into the instantaneous world we live in, where we expect results straight away, it’s important to understand that when it comes to our health, we need to leave this to the professionals and not to get caught up in the motivational memes, impeccably dressed personalities and the placement of clickbait in our online world. BodyMatters specialises in treating clients who are experiencing disordered eating and body image issues. Contact us to find out more about our services.